Another Northumberland, Tyne and Wear NHS Foundation Trust (NTW) event! The run up to this one was a little bit… well the staff called it ‘woolly.’ Apparently, that was on purpose because the entire event was to launch the brand-new Adult Mental Health Network and with it being such a unique and one-of-a-kind venture, there’s no real model or guide on what it should look like. 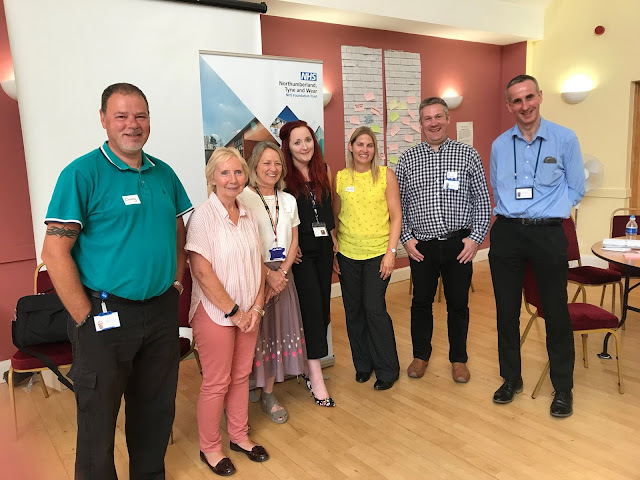 The launch event centred around bringing together a huge variety of people from a selection of charities and organisations what ranged from Age UK to Carers Northumberland to representatives of the RESPOND training. Immediately, the atmosphere was incredible – you get so many events where people are there because their manager has asked them to be and you can feel a reluctance and pressure there… At this event though, there was a clear feeling of everyone being there because they wanted to and that they actually wanted to learn. I was originally invited to do some social media and blogging work on the event and the new Network but then I was asked to do the opening speech alongside the incredible Jan Bostock (who was actually a Psychologist of mine). In our second meeting, it turned out that I was needed to help facilitate one of the activities and when my co-facilitator (Selma Ebrahim) had to leave early, I took over the final session by myself. For these reasons, I’m confident in saying that this was one of my most favourite events that I’ve taken part in because I was given so many responsibilities. Unlike a 9-5 office job, a ‘promotion’ in the type of work that I do is a very individual element; it’s not as simple as saying ‘well now I’m the Manager’ or ‘now I get paid more.’ The way I look on it is that I’ve gone from being trusted to distributing leaflets and merchandise to now running organisation’s social media and having opportunities equal to those of the most senior staff. To me, responsibilities aren’t stressful; they’re rewarding, and I appreciate any organisations who give me so many. So huge thank you to Paul Nicol and Lynsey Martin!! The activity I chose to help facilitate was about trauma-informed care and practice. The first question we put to the groups doing this activity was: ‘what do you think we mean by ‘trauma-informed’?’ The way I’ve interpreted it is that it’s all about keeping in mind a person’s trauma in practice and care. My automatic example of this would be in restrictive practice where a person was sexually abused. In other words, restraining someone who has been through that and holding them down, can be triggering and detrimental to their mental health. For me, my natural reaction to be restrained – because of what I went through as a teenager – is to lash out and resist the holds. This behaviour had me labelled as violent and aggressive with professionals who didn’t use trauma-informed care and practice. At first, we (co-facilitators) thought that it was going to be like Ground Hog Day as we covered the same grounds on each group… and there were eight groups! But actually, after going through a few basics, the fact that we had different people from different organisations and with different job roles, meant that everyone had different ideas and thoughts around the topic. It was great to hear different view points and there were a few times when I had to admit I thought ‘oh my goodness; I never thought of it like that.’ And at the same time, everyone was really respectful of my journey and my experience of trauma and talked about how my part in the day had opened their eyes to a lot of aspects of mental health care and practice that they might have never considered or recognised. A few of the activity participants opened up about their own life and experiences of trauma which was incredibly powerful. And it just goes to show that you don't always know what someone is going through.